Slam Dunk Like the Pros ! 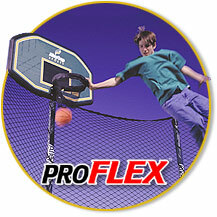 The Only Backboard Created For Safe Trampoline Play. Advanced Shock-Absorbing Hoop Design-Patent Pending! "We have slam dunk contests just like the NBA!" "Our kids love sleeping on the tramp safe from the mosquitoes!" -Mother of 2.
balance, and stamina in our kids!" -M.D. 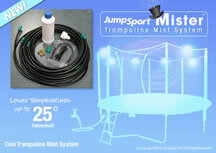 Install this Custom Mist System to Drop Trampoline Play Space Temperatures by up to 25 degrees Fahrenheit! 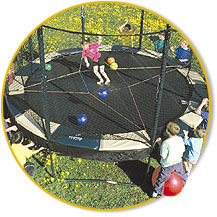 - Fits up to 14ft round trampolines and up to 10x17 rectangle trampolines with safety net. - 90 day warranty against manufacturer defects. 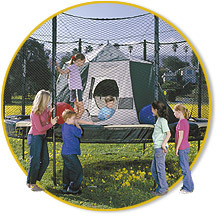 - Drops Trampoline Play Space Temperatures by up to 25 degrees Fahrenheit. - Adds hours of extended play time to your backyard trampoline every summer! 48 foot prefabricated nylon misting system assembly, with 7 nozzle tees conveniently spaced for attachment between enclosure poles. 7 Brass misting nozzles, plus one spare nozzle. 6" in-line water filter - removes sediment and softens water. 22 Cable ties for fast and easy installation. 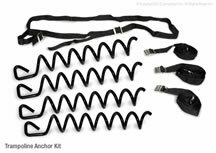 Attaches easily to any 3/4" garden hose. Step Up to the Fun!! Our durable, safe, SureStep Ladder easily attaches to the trampoline. 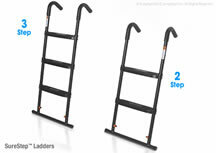 - 2 Step Ladder fits the Economy, SoftBounce, StagedBounce (all sizes), JumpSport PowerBounce (all sizes), JumpSport Elite (all sizes), JumpSport Elite PowerBounce, VariableBounce (all sizes), and AlleyOop PowerBounce trampolines (all sizes). It will also fit most other trampolines between 33 inches and 37 inches tall. Protect Your Investment! Secures your Trampoline to the ground! - "4 large, heavy-duty "cork-screws" twist into the ground. A sturdy strap secures to each cork-screw and attaches to the frame of the trampoline. When properly installed, the trampoline will be divided into 4 equal sections to evenly distribute the tension and safely secure your trampoline and enclosure to the ground. 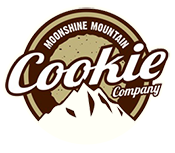 Copyright 2002-2017 FunMakers, Woodplay, Inc., and Goalsetter Systems. All Rights Reserved.